A new addition to the Marcia Nardi Papers is now processed and available for use. The new addition, which the Beinecke acquired in 2004, contains correspondence and drafts reflecting Nardi’s work with John Edmunds between 1972 and 1983 and provides insight into the later years of Nardi’s life. Marcia Nardi (1901-1990) was born Lillian Massell in Boston, Massachusetts. In 1921, rather than continue her studies at Wellesley College, she moved to Greenwich Village and remade herself as the poet Marcia Nardi. During this period Nardi contributed poetry and book reviews to publications such as the Nation, New Republic, Quarterly Review of Literature, the New York Times, and the New York Herald Tribune. In 1942 Nardi met William Carlos Williams with whom she began a correspondence. Williams used Nardi’s letters, which discuss the difficulties of being a female poet in contemporary literary circles, in his epic poem Paterson. Williams also encouraged Nardi to publish her poetry, an endeavor that came to fruition with Nardi’s first book, Poems, published by Swallow Press in 1956. Yet the publication of Nardi’s book did not provide her with financial freedom to focus on her poetry and Nardi continued to struggle with poverty, health problems, loneliness, and increasing doubts as to her creative abilities. 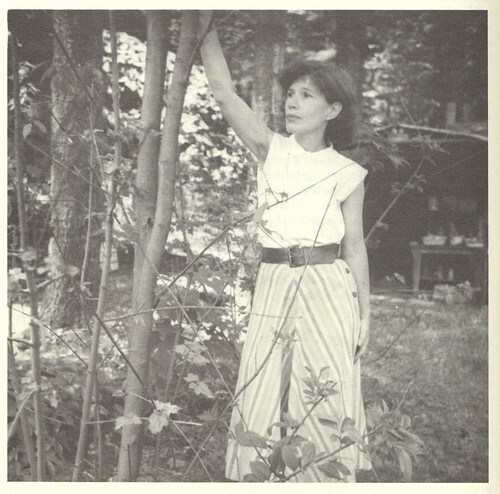 During the 1970s and early 1980s John Edmunds worked with Nardi in order publish a book of her collected poems. As their correspondence documents, Nardi and Edmunds’ relationship went beyond professional, with Edmunds providing Nardi with financial and emotional support. A description of the collection can be found on line: Marcia Nardi Papers. Related materials in the Beinecke Collections can be found by searching the Finding Aid Database; recently acquired materials may be found in the Uncataloged Acquisitions Database. Marcia Nardi’s published work can be located by searching Orbis, the library catalog. 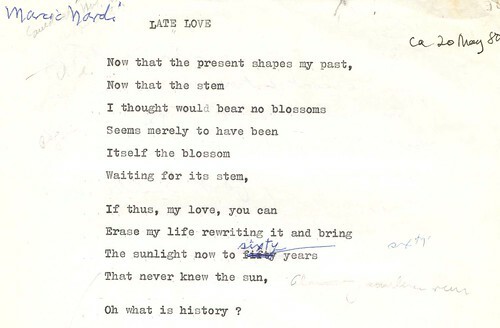 Images: Photo of Marcia Nardi from Rossetti to Sexton: Six Women Poets at Texas, edited by David Oliphant, Austin: Harry Ransom Humanities Research Center, 1992; excerpt from manuscript, “Late Love,” Marcia Nardi Papers, YCAL Mss 70, Box 2, Folder 35. The MacDowell Colony, one of America’s oldest and most important artists’ colonies, celebrates its centenary in 2007. Founded by composer Edward MacDowell and his wife Marian on their property in Peterborough, NH, the Colony provides emerging and established artists with time and space to develop their work. In this way, the Colony has played an important supporting role in the development of American literature and art in the 20th century. Many poets and writers whose papers are housed in the Yale Collection of American Literature can be counted among the hundreds of poets, writers, playwrights, composers, and artists who have lived and worked at the MacDowell Colony its first hundred years. MacDowell Colony poets whose papers are part of the Yale Collection of American Literature include Alfred Corn, Robert Fitzgerald, Frances Frost, Marilyn Hacker, Marcia Nardi, Lola Ridge, Grace Schulman, Jean Star Untermeyer, and Marjorie Welish. Siblings (and poets) Laura, William Rose, and Stephen Vincent Benét each enjoyed residencies at the Colony. Their correspondence with Marian MacDowell, as well as with many friends in literary and artistic circles, is in the Benét Family Papers. The Colony supports novelists, essayists, and playwrights as well as poets; MacDowell Colony writers whose papers are in the Beinecke Library collections include Elizabeth Shepley Sergeant, Josephine Herbst, Chard Powers Smith, Donald Ogden Stewart, and Gilbert Seldes. Playwright Thornton Wilder was a frequent visitor and he wrote some of his most important work at the Colony; Peterborough was, in fact, his inspiration for the town of Grover’s Corners, the setting of his play, Our Town. The Thornton Wilder Papers include manuscript drafts of Our Town and most of his other works, as well as playbills, scripts, and photographs from productions of his plays; images from the archive can be seen in the Beinecke’s Digital Library: Thornton Wilder Papers. The papers of several composers who have stayed at the MacDowell Colony, including those of Virgil Thompson, Henry Gilbert, Hershey Kay, and Karl Weigl are housed at Yale’s Irving S. Gilmore Music Library. The works of these and other MacDowel Colony residents can be located in Orbis, Yale’s library catalog. Images: Elizabeth Sheply Sergeant with other artists and writers in residence, MacDowell Colony, 1950s; Elizabeth Sheply Sergeant at Mixter Studio, 1950s; Thornton Wilder at the MacDowell Colony with Marian MacDowell and others, 1952.